The average cost of memory care in Hauula is $6,595 per month. This is higher than the national median of $4,650. Caring.com has helped thousands of families find high-quality senior care. To speak with one of our Family Advisors about memory care options and costs in Hauula, call (855) 863-8283. Located on the windward shore of Oahu, Hauula, Hawaii, has approximately 4,100 residents, including 380 senior citizens. In Honolulu County, Alzheimer's disease affects 10.7 percent of Medicare recipients, a rate that's slightly higher than other parts of Hawaii and the United States. According to the Hawaii Office of Health Care Assurance, assisted living facilities and adult residential care homes may offer services to dementia patients. Although memory care facilities aren't subject to specific regulations, they must follow all rules that apply to conventional assisted living facilities and adult residential care homes. Hauula has one qualified memory care facility, and several additional facilities are located on Oahu. The area's idyllic climate is part of the reason why Hawaii is such a popular destination. With a Comfort Index of 98 out of 100, Hauula has a nearly perfect score. Residents enjoy 271 days of sunshine and mild temperatures with average lows of 65 degrees and average highs of 83. Families who are concerned about severe weather may want to review the facility's evacuation plan for further information. Hauula has the best overall air quality in the nation. The metropolitan Honolulu area was tied for first place based on its low ozone levels and minimal particle pollution. These conditions may benefit residents who have asthma, COPD or chronic respiratory illnesses. The cost of living in Hauula is almost twice as high as the national average although it's similar to other parts of the Aloha State. Housing is three times more expensive compared to the rest of the U.S. Residents also pay more for groceries, transportation and utilities. All of these factors can affect the cost of memory care. However, medical expenses are slightly lower than the national average. Hauula has few facilities from which to choose in the event of a medical emergency or illness, with the nearest major hospitals specializing in brain health and dementia care being the Kahuku Medical Center in Kahuku or Adventist Health Castle in Kailua. Memory Care costs in Hauula start around $6,595 per month on average, while the nationwide average cost of memory care is $4,781 per month. It’s important to note that memory care rates in Hauula and the surrounding suburbs can vary widely based on factors such as location, the level of care needed, apartment size and the types of amenities offered at each community. Learn more about these programs, plus who’s eligible, on our Memory Care in Hawaii page. For more information about different ways to finance memory care, visit our Memory Care in Hawaii page. 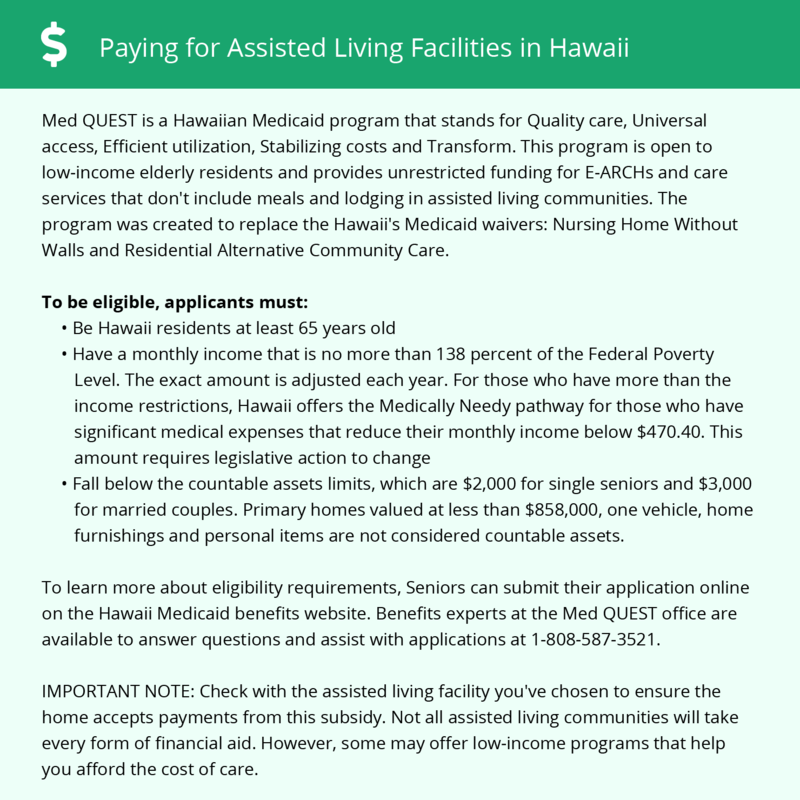 Hauula and the surrounding area are home to numerous government agencies and non-profit organizations offering help for seniors searching for or currently residing in an assisted living community. These organizations can also provide assistance in a number of other eldercare services such as geriatric care management, elder law advice, estate planning, finding home care and health and wellness programs. To see a list of free memory care resources in Hauula, please visit our Assisted Living in Hawaii page. Hauula-area assisted living communities must adhere to the comprehensive set of state laws and regulations that all assisted living communities in Hawaii are required to follow. Visit our Memory Care in Hawaii page for more information about these laws.